Saturday morning I woke up to lots of puppy kisses and husband cuddles. As I got out of bed, I saw a red rose sitting on my nightstand with a little note. 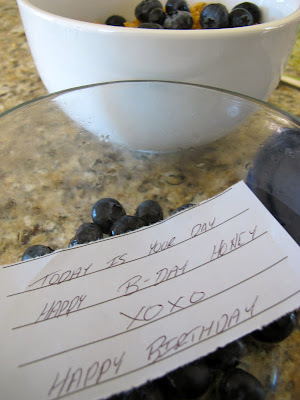 From on my toothpaste to in my bowl of blueberries, I found handwritten notes from Bryan everywhere. The note that surprised me the most was the one that was on the ottoman at the foot of our bed. You see, Bryan and I do not give each other birthday gifts. But this note implied there was a gift inside, and I was puzzled. I opened the ottoman to find a card and the most perfectly wrapped box. Next thing you know I'm crying happy tears, but at the same time saying "this is too much... too much." Bryan explained to me all of the reasons why I deserve this amazing present - one that I will be rocking when I'm 80, God willing! Oh look, it came with a puppy! While pipe dreaming, I always said that I wanted a Speedy 35, but after seriously thinking about it, that size is entirely impractical and too gaudy for my taste. But the Speedy 30? Pure perfection! Knowing the reasons why Bryan gifted it to me, along with the touching words he wrote in my card and the little notes he left everywhere, makes me fall in love with him all over again... He is such a sentimental, thoughtful and appreciative man. He thinks he's the lucky one, but I know that I am! i was a person who cried, this post might make me shed baby tears. bryan is THE sweetest person i know...but you deserve all that you have and more! You certainly are a luck one! If only more men were like him! So sweet! I hope you had the best birthday ever. How sweet!!! 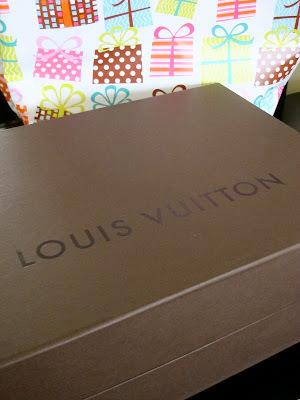 :) This reminds me of when Jusitn first surpised me with my first Coach bag! You guys are adorable! Happy Birthday! OMGAH!!!!!!!!! Can I give him my husbands email?? They need to talk! Yay yay yay! Awesome gift from your forever boyfriend! I've wanted one for a long while too - such classic bags. Can't wait to see lots of your cute outfit pics with it! Awww that is toooo cute! :) Happy Birthday! HOW SWEET!!!!!!!!!!!!!!!!!!!! I'm gonna make sure my husband sees this post so he takes a mental note about writing little love notes on birthdays and LV gifts!!! How sweet of him! You've got yourself a keeper! Now if only the rest of us can find our prince! How sweet?! What a great husband! WOW! What an amazing birthday! Aw you are so darn cute... Alix of Traffic Jelly and I were talking on the phone the other date and brought up how we love reading your blog...and then how freaking cute and in love you and Bryan are. Please keep sharing it with us single gals...gives us hope that there are a few good gents out there. :) xoxo and HAPPY BIRTHDAY again to you, my dear. You are a lucky girl! I only wish I could find a man as sweet as your husband is! aww, what a sweet guy! Happy Birthday! How sweet is that, you both are lucky indeed. Enjoy your special day! and love you at the same time. I want to be you. awwwwww... i love the notes just as much as the present! so cute of your hubs! Aw sweet!!!! I hope your day was the best one yet! You guys are just THE cutest! That was so sweet of him & of course, what's a speedy 30 or 35 without your cute cuddly pup?! you lucky girl! :) happy birthday! you've got a keeper on your hands!! Wow, this is SO sweet! You have a great forever boyfriend there girl! Umm WHOA! 20 points for Bryan!! LOVE your new bag! Happy (late) birthday! MWAH!